Parking on a little peninsula with a little Cemetery and a little Church. Parking on a little peninsula with a little Church and Cemetery. You can find here a little Beach in a closed bay or a bigger beach in a bigger bay. Better you use the bathing-shoes – cause there are also rocks inside the water! No Shower, but Water here. They said, that the Water should be open from 5pm to 7pm, but it was also running in the morning. This Articel was read 380 times! 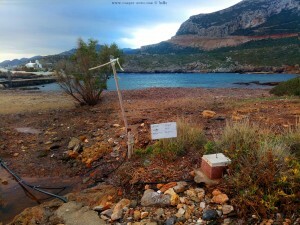 Dieser Beitrag wurde in Countries, Free Camping - Wild Camping, Fresh Water, GPS, Greece, Travel-Facts veröffentlicht und mit Agios Fokas, CampingCar, Coast, Freistehen mit dem Wohnmobil in Griechenland, Grecia, Greece, Griechenland, Küste, Laconia, Mediterranean Coast, Meer, Mittelmeer, Monemvasia, Motorhome, Parking at Unnamed Road - Agios Fokas – Greece – October 2018, Peloponnese, peninsula, Reise, Reisebericht, Reiseberichte, Reiseblog, Reisen, Reisen im Wohnmobil, Reisen im Womo, Reisen in Spanien, Reisen in Spanien mit dem Wohnmobil, Reisen mit dem WoMo in Spanien, Salzwasser, Sand, Sonne, Strand, Travel, Travel in Greece, Travel with a Camping Car, Travel with a CampingCar, Travel with the Camping Car in Greece, Travel with the CampingCar in Greece, Travel with the Motorhome, Travel with the MotorHome in Greece, Travelblog, Travelbook, Unser Camper, Water in Agios Fokas – Greece getaggt. Yes – we are sharing the Places we found in our Trip through Europe and Morocco!